This M4 is fitted as standard with an 18.5” barrel and a 7 round magazine. The special telescopic stock can be reduced by 13 cm in length simply by pressing a button. 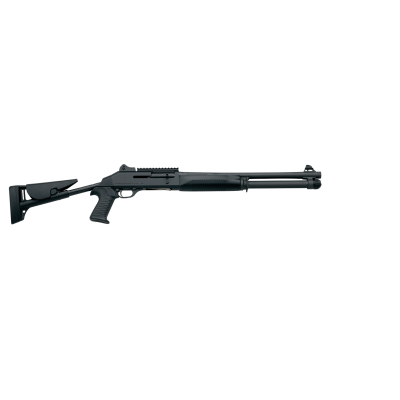 The versatility of this shotgun is further enhanced by a range of interchangeable stocks including a fixed stock and pistol grip stock, both made from fibreglass reinforced technopolymer and both interchangeable without tools. 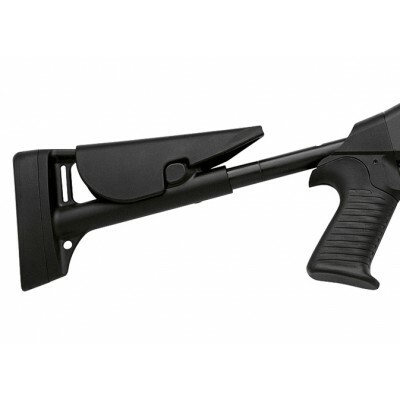 The rubber recoil pad at the shoulder end of the stock further reduces the effect of the shotgun’s already limited recoil. To make full use of its impressive accuracy, the M4 is fitted with a front blade sight with protective wings and an adjustable dioptre. The sights can also be fitted with luminescent markings for shooting in poor light conditions.